Our first day in Luxor would soon become busy, very busy. But, before heading out to our ceremonies, I thought it prudent, to first take a picture of the Temple of Luxor, which was just across the street from our hotel balcony. As I look at it now I cannot help but marvel at the view. They say one picture is worth a thousand words. But in this case that is not correct. My picture is trivial compared to what is truly there. years ago. Our visit across the road will last not even a blink, in the life of the temples. We have come to visit a track club on the other side of the Nile. It is after school and the kids are preparing for an upcoming meet. The kids are barefoot and the track is in questionable condition. I have spotted a herd of sheep making their meandering way down one side as the kids start laps on the other. Our little Harmony run team of 3 arrives there at dusk, in the middle of a hard workout. Everything stops for our little ceremony. We have a translator who translates into Arabic, Rastia's talk. We have the kids guess each of the countries we come from. The kids enjoy this. They also enjoy when we sing the World Harmony run song. The kids are very attentive. This may be the first time that foreigners have come to their school. As I look at these pictures now, several weeks later, I wonder if I have somehow made a mistake somewhere. I clearly remember the kids smiling for us, and having a good time. Yet as I look now I can find few smiles. I realize that the smiles will come later. After we have spent time with the kids the next day. We will spend nearly a full day with a small group and we will gradually got to become friends. 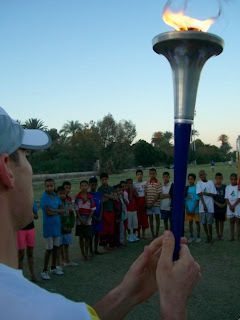 On this night the young athletes take turns caring the torch around their rugged track. It is hard for them to hold back. Each time one gets a hold of the torch they start to surge in front of the others. There is just so much energy. On this side most of the track has just disappeared. It cannot be from rain, and I did not dare to ask the coach. I could not imagine how these barefoot kids could train here and yet they do. It is also very clear their dedication to training in all the disciplines of track and field. We pose for group pictures after all have had their turn with the torch. As I look at this picture now, after not seeing it for a few weeks I think I can solve the mystery of the missing smiles. The kids felt like athletes who were representing their country in front of the world. In this case 3 guys from far away. They were proud of their athleticism and I think wanted to demonstrate it with dignity. This then is another photo which doesn't show the whole picture. Click on this picture to see if I am right. I would be hard pressed to find anything negative to say about our stay in Luxor. Just to leave the great cauldron of humanity, which is Cairo, was a relief in itself. Here we were provided, courtesy of the Egyptian Athletic federation, hospitality, a van, a guide, and something unexpected, real friendship. 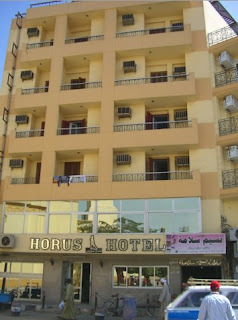 The Horus hotel is just a simple little place, right in center of Luxor. 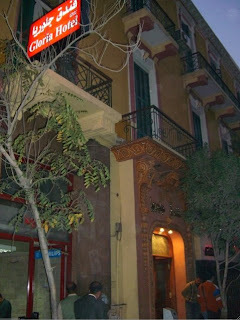 Our hosts brought us here after it had been recommended by our friend in Cairo, Mr.Fahmy. In the morning there was a simple breakfast on the second floor. The room, though small, had a real bathroom. By this time clothes needed cleaning and we had this done here at a reasonable price. This is around the corner from the hotel. It is just construction going on. A lot is happening in this small town. A swell of tourists come here for the spectacular antiquities. The infrastructure is trying to keep up. If you were staying in a fine resort, enclosed in 5 star comfort you might not see this. Or only in your horse cart as you drive by. Our first morning in Luxor turned into a relaxing get to know you session. we went to a new library, and then we went for tea. In North Africa you have tea.....a lot. The boys wanted to play dominoes. He is man who will help us a lot in the next few days. He speaks some English but was uncomfortable about dolling out his limited vocabulary. We had a guide and translator but somethings just do not need translation. There is a sound a domino makes when it is slapped down on the board. There is no sound as friendship builds between strangers who cannot speak the same language. Later I will take a break and look out our window. There is a small balcony overlooking the street. But across the street, between my toes is the splendor of the Temple of Luxor. We will be here for several days and despite the fact it was just there, across the road, we will not have time to enter. 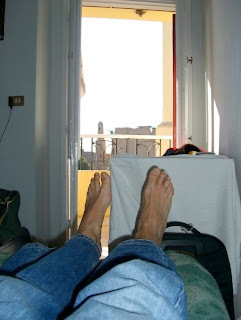 It is my first morning in Cairo and I am exhausted, after taking a long flight from New York via Zurich to get here. I am staying in a tired section of Cairo which feebly hints of a glorious and glamorous past. The hotel room I have spent the night has no pretensions whatsoever. The morning calm is suddenly shattered by shouts coming up from the street below. I see a swirl and sway of a large group of men. Sides have been taken, but I cannot tell for sure for whom. There are loud voices and angry gestures but I have seen no violence. There is an obvious hint though that one man has received a blow to his stomach. A woman comes to the aid of the afflicted man and tries to give him comfort. A wife? A sister? Who ca n tell? I can barely hear the words rushing up from the street even if I could understand Arabic. he is about to be whisked away for treatment. Instead of rushing off to the hospital he is brought a cup of mint tea carried to him on a silver platter. Soon life on busy Amin El Dein street returns to normal. Once again it is peaceful and serene. It whispers again sweet dreams off its past. It asks us not to dwell too long on noises, that are so brief, they almost cannot be heard. It is a kind of dance in which one of the dancers...."me", cannot hear the music or knows the steps. I have arrived at Cairo airport from Zurich and have little idea of where I need to go in Cairo, but at least have some vague notion of how much I should pay. I am approached again and again by one questionably sincere man after the next. I dodge and plod on pulling heavy bags. You cannot help but feel like live bait in a great sea of sharks. But the truth is tamer and certainly there is no danger. You may loose your money but not your life. A price is finally agreed upon. Who knows whether or not it is fair. It is no longer at least outrageous. into the heart of Cairo. I will take many trips here in this great capital. Many times the driver cannot speak English, or simply does not know where I want to go. A solution presents itself when stuck in interminable traffic. Ask the man in the next cab. Most likely if he doesn't know he will like at least to have a chat. You can almost wish at moments like this how great it would be to reach out and hand them a cup of tea. There is another option of course, and that is to simply pull over to the side of the road and ask for help. People and life move here at quite a different tempo. You can get to your destination.